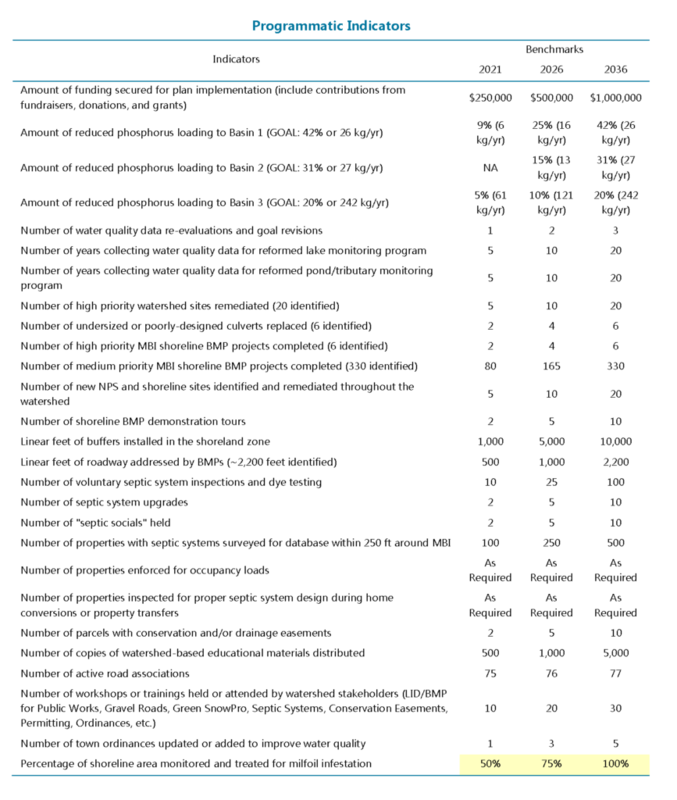 The Moultonborough Bay Inlet Watershed Restoration Plan provides a roadmap for preserving the water quality of MBI, and provides a mechanism for procuring funding (e.g., Section 319 grants) to secure actions needed to achieve the water quality goal. With the help of LWA, this watershed restoration plan should be carried out by an advisory committee similar to the one established during the development of this plan. Local participation is an integral part of the success of this plan, and should include the leadership of local municipalities, such as the Towns of Moultonborough and Sandwich. This task will also require the support of other stakeholders, including conservation commissions, NHDES, schools and community groups, lake/road/neighborhood associations, local businesses, and individual landowners. The primary stakeholder group will need to meet regularly and be diligent in coordinating resources to implement practices that will reduce NPS pollution in the MBI watershed. Funding: form a new subcommittee to focus on obtaining funding for the other subcommittees. Education and Outreach: form a new subcommittee to focus on education-related action items that incorporate elements already being implemented and targets communities within the MBI watershed. Septic Systems: form a new subcommittee to focus on improving septic system maintenance in the watershed. Planning and Land Conservation: form a new subcommittee to focus on improving municipal ordinances and increase the amount of conserved land (work with local land trusts and conservation commissions). BMP Implementation: redirect existing subcommittee to focus on BMP action items and coordinate with the funding subcommittee on applying for the next phase of 319 implementation funds. Water Quality Monitoring and Assessment: continue existing subcommittee to focus on monitoring action items, including a revision of the long-term monitoring program. These subcommittees will be charged with implementing projects and actions within the Action Plan with the support and assistance of state and local natural resource agencies and groups. It is important to note that these subcommittees are merely recommendations under ideal circumstances where membership numbers allow for proper staffing of each subcommittee. It may not be practical to have subcommittees if committee membership is low. LWA should work to encourage more participation, if this is the case. The Action Plan was developed through the combined efforts of LWA, FB Environmental, and the Advisory Committee, as well as the public by way of feedback provided during public review of the draft plan. The Action Plan is a critical component of the plan because it provides a list of specific strategies for improving water quality and the means to make the water quality goals a reality (Section 1.2; 3.3). The Advisory Committee should work toward implementing the Action Plan and identifying improvements, as needed. The Action Plan consists of action items that help address threats identified within five major categories: (1) Septic Systems; (2) Watershed and Shoreline BMPs; (3) Roads; (4) Planning and Land Conservation; and (5) Water Quality Monitoring. 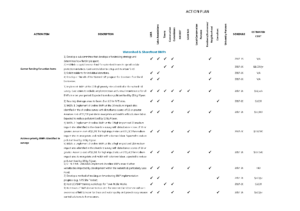 The Action Plan outlines responsible parties, potential funding sources, approximate costs, and an implementation schedule for each task within each category. Current cost estimates for each action item will need to be adjusted based on further research and site design considerations. Watershed and shorefront residential development was also identified as a significant threat to the water quality of MBI. Direct shoreline areas are typically among the highest for pollutant loading given their proximity to lakes and desirability for development. The Advisory Committee and technical staff conducted a comprehensive shoreline survey in 2015 for MBI, Garland Pond, and Lees Pond, and found that 58% of the shoreline area surveyed received high disturbance scores and are likely impacting water quality. It was also estimated by the LLRM that the direct drainage areas to MBI provide the greatest phosphorus load per unit area compared to the other subwatersheds. As such, the shoreline deserves special attention in any lake protection plan, and MBI is no exception. The BMPs recommended in this plan are restoration tools that property owners can use to minimize impacts from stormwater runoff and restore degraded shoreline areas. This could be as simple as planting vegetated buffers, installing gravel driplines along roof edges, and ensuring that path and driveway runoff is filtered into the ground rather than forced overland to surface waters. Coordination with landowners is crucial for successful implementation of BMPs identified in this plan because many of these mitigation measures will need to be implemented on private land. LWA hosted a “Landscaping at the Water’s Edge” talk at the Moultonborough Public Safety building. The talk was given by Cathy Neal of the UNH Cooperative Extension. LWA gave a presentation on DIY stormwater management tips for homeowners on May 28, 2016 at the Loon Center in Moultonborough; 30 people were in attendance. A “SOAK Up the Rain” display was put up at the Moultonborough Public Library from June 8 to August 9, 2016. Septic systems were identified as a significant threat to the water quality of MBI. This includes septic systems built in saturated areas, used beyond design capacity, or maintained improperly. Septic system effluent typically stores a thousand times the concentration of phosphorus found in lake waters, which means that a small amount of effluent could have a major impact on surface waters. An old or improperly-maintained septic system can also result in the delivery of disease-causing bacteria or viruses that can result in gastro-intestinal illness in swimmers. Untreated septic waste may contain chemicals and hormones used in pharmaceutical and personal care products, which can reach lake water if a system is not working properly. Inundation of systems by groundwater greatly enhances the transport of phosphorus and pathogens to the lake. Therefore, it is critical to ensure adequate setbacks and good vertical separation from the seasonally-high groundwater table. Based on the watershed modelling that has been completed, wastewater systems, including septic systems, outhouses, and cesspools, are the third largest source of phosphorus to the watershed. The contribution of septic systems was estimated to provide 5% (3 kg), 9% (8 kg), and 4% (47 kg) of the phosphorus load to Basins 1, 2, and 3, respectively. A wastewater inspection and maintenance program would help to reduce phosphorus and bacteria loading to MBI. Meaningful reductions in phosphorus loading to the Inlet will be achieved if landowners take responsibility to check their systems, and make necessary upgrades, especially to old systems, cesspools, and outhouses. LWA hosted a Septic Sense Seminar on August 5, 2014 at the Balmoral Improvement Association’s Clubhouse. The seminar was presented by Gary Spaulding, a member of Granite State Designers and Installers Association; 19 people were in attendance. Threats to water quality as a result of roads include undersized culverts, excess road salt and sand, lack of stormwater control, lack of resources to improve and maintain road infrastructure, and erosion from gravel or logging roads in the watershed. The 2015 watershed survey conducted by LWA and FB Environmental identified 56 sites that are resulting in the delivery of nutrients and other pollutants to the lake. Of these sites, 40 are associated with state, town, or private roads or municipal parking lots. Several of these road sites are a significant threat to water quality due to their proximity to the lake and its tributaries and their ability to deposit sand and gravel directly into the water. Refer to Appendix G for a separate list of recommended culvert replacements identified during the watershed survey. Refer to Appendix D for the top 20 priority BMP sites that include a mix of road fixes. LWA hosted a Gravel Roads Workshop for road associations and other interested stakeholders from around the State on July 11, 2015. The 2.5-hr workshop presented by Russ Lanoie was attended by 28 people, 16 of which were from Moultonborough. NH Lakes teamed up with Lees Pond Association and Moultonborough Academy in July 2014 to identify and implement BMP projects at the Lees Pond access road and boat ramp. Municipal land-use regulations are a guiding force for where and what type of development can occur in a watershed, and therefore, how water quality is affected because of this development. The build-out analysis indicates that there is room for improvement in protecting water quality through non-structural BMPs such as municipal ordinance adoption or revisions, especially as it relates to new development. Action items were based on improvements identified by technical staff during a review of water quality-related ordinances for the Towns of Moultonborough and Sandwich. It is anticipated that Basins 1, 2, and 3 will experience a 53% increase (to 95 kg/yr), 55% increase (to 133 kg/yr), and 51% increase (to 1,819 kg/yr) in phosphorus loading at full build-out (2058), respectively. Improving municipal ordinances that help protect water quality in the watershed will help mitigate the estimated 16, 22, and 294 kg/yr of additional phosphorus loading that Basins 1, 2, and 3 will receive in the next 20 years, respectively. 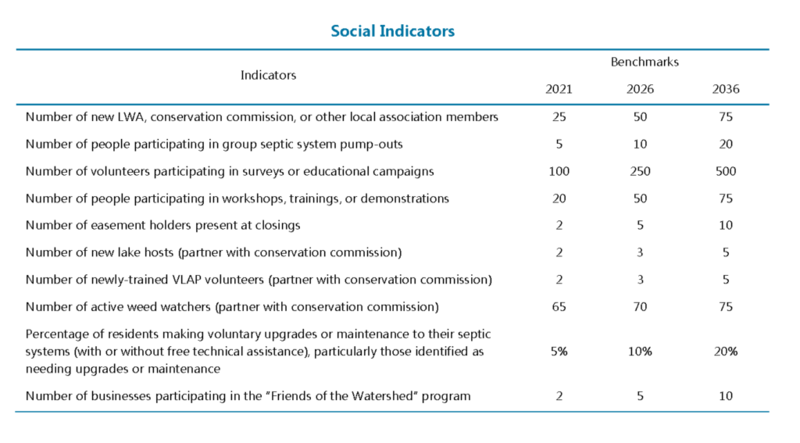 Monitoring programs are crucial to evaluating the effectiveness of watershed planning activities and to determining if water quality goals are being achieved over the long-term. The Action Plan includes recommendations for enhancing current water quality monitoring efforts, including sample collection from various tributaries and ponds, and continuation of the invasive species monitoring program. Since volunteers typically conduct many different monitoring activities, it will be critical to continue building on the success of the area’s ongoing education, outreach, and volunteer monitoring programs. Refer to Appendix B for a map showing current lake monitoring sites in the Inlet. Take regular, annual DO and temperature profile readings, Secchi disk readings, and epilimnion and hypolimnion total phosphorus and epilimnion chlorophyll-a samples at a minimum of one station per basin. Recommend WMO00GL (Green’s Basin), WMO01BL (Blanchard’s Island), and WMO01LL (Little Ganzy). Aim for biweekly Secchi disk readings and monthly DO and temperature profile readings combined with chemical sampling. Assumes a sampling season from June-September. Add additional parameters to collect from the epilimnion, including pH, alkalinity, color, total dissolved nitrogen, and total dissolved organic carbon. Add additional sampling sites in Basin 3 for the full sampling program addressed above. This will depend on available funding and/or desires of project partners. Expand sampling outside normal season (June-September) to include spring and fall turnover. This will provide information on how the Inlet responds to environmental changes during critical turnover periods and help to better estimate internal loading contributions. Team up with university consultant to take sediment cores at the three basins or other critical areas around the Inlet. This will provide valuable historical information regarding changes in water quality over time. Install 3-season buoy system in the three basins to monitor DO and temperature throughout the water column using continuous data loggers. This would provide a finer-scale resolution of changes in DO and temperature throughout the season, so that we could pinpoint critical turnover times, determine the extent and duration of anoxia, and track changes over time. Encourage continued regular sampling of Lees Pond. Take regular, annual DO and temperature profile readings, Secchi disk readings, and epilimnion and hypolimnion total phosphorus and epilimnion chlorophyll-a samples at the deep spot. Consider including pH, alkalinity, color, total dissolved nitrogen, and total dissolved organic carbon. Aim for biweekly Secchi disk readings and monthly DO and temperature profile readings combined with chemical sampling. Assumes a sampling season from June-September. Expand pond sampling to include other major waterbodies in the watershed, including Garland Pond, Shannon Pond, Berry Pond, Red Hill Pond, Little Pond, Dinsmore Pond, and Meadow Pond (in order of priority). This will provide critical information for better predictive ability of the land use model. This need only be done 1-3 times per year for epilimnion total phosphorus and chlorophyll-a. Sample major tributaries flowing directly to MBI, including Lees Pond outflow, Halfway Brook, Middle Brook, Shannon Brook, Tributary 2 to Basin 3, Basin 1 Tributary, and Basin 2 Tributary. Sample for total phosphorus at a minimum. Sampling should occur at least 3 times per year and cover both baseflow and stormflow conditions. This will provide critical information for better predictive ability of the land use model. Add additional parameters to collect from the major tributaries flowing directly to MBI, including pH, coli, total dissolved nitrogen, chloride, and turbidity. Add additional tributary sampling sites for the full tributary sampling program described above. Recommended sites are the outflows of Stanton Brook, Creamery Brook, Montgomery Brook, Cook Brook, Skinner Brook, Tributary 2 to Red Hill Brook, and Weed Brook. Consider installing continuous data loggers measuring flow, DO, conductivity, and temperature at key tributary locations. These data would be useful in understanding water quality processes in the watershed. Coupled with water chemistry data, loading rates of nutrients may be calculated using the continuous flow data and used to update the land use model. The Town of Moultonborough is currently joining the NH LoVoTECS program run by Plymouth State University. Temperature, conductivity, and flow will be measured continuously in four tributaries flowing into Lake Winnipesaukee within the Town. Establishing indicators and numeric targets (benchmarks) to quantitatively measure the progress of this plan will provide both short-term and long-term input on how successful the plan has been in meeting the established goals and objectives for the watershed. Understanding where we will be following watershed improvements compared to where we should have been following no action will help guide adaptive changes to these benchmarks (e.g., goals are on track or goals are falling short). If the benchmarks are not being met due to lack of funding for implementation projects versus new development TP loading outpacing improvements to existing development TP loading, this creates much different conditions from which to adjust benchmarks. For each benchmark year, the committee should meet to update water quality data and the model and assess why goals are or are not being met. The committee will then decide on how to adjust the next benchmark goals to better reflect water quality conditions and practical limitations to implementation. It is also important to note that there are several larger ponds within the Basin 3 drainage that should set their own water quality goals and TP reduction goals to help improve water quality in MBI. The following environmental, programmatic, and social indicators and associated benchmarks will help measure the progress of this plan. These benchmarks represent short-term (2021), mid-term (2026), and long-term (2036) targets for improving water quality in MBI. Setting benchmarks allows for periodic updates to the plan, maintains and sustains the action items, and makes the plan relevant to ongoing activities. ENVIRONMENTAL INDICATORS are a direct measure of environmental conditions. They are measurable quantities used to evaluate the relationship between pollutant sources and environmental conditions. They assume that BMP recommendations outlined in the Action Plan will be implemented accordingly and will indirectly result in water quality improvements. Note that the benchmarks for environmental indicators can also reflect mitigation of anticipated water quality degradation as a result of new development. The cost of successfully implementing this watershed restoration plan for MBI is estimated at over $1,000,000 over the next twenty years (Table 5.2). However, many costs are still unknown and should be incorporated into the Action Plan as information becomes available. These costs will come from a variety of stakeholders, grants, or other funding sources identified in the Action Plan. This includes both structural BMPs, such as fixing eroding roads and planting shoreline buffers, and non-structural BMPs, such as improving ordinances. Annual BMP costs were estimated based on a ten-year total for the initial BMP installation plus ten years of maintenance (refer to Table 4.1). A diverse source of funding and a funding strategy will be needed to match these implementation activities. Funding to cover ordinance revisions and third-party review could be supported by municipalities through tax collection (as approved by majority vote by town residents). Monitoring and assessment funding could come from a variety of sources, including state and federal grants (Section 319, ARM, Moose Plate, etc. ), municipalities, conservation commissions, LWA, and lake associations. Funding to improve septic systems, roads, and shoreland zone buffers could be expected from property owners. As the plan evolves into the future, the Advisory Committee will be a key part of how funds are raised, tracked, and spent to implement and support the plan. Much effort is already being done by various groups (e.g., LWA, Moultonborough Conservation Commission, Milfoil Committee, etc.) in the watershed to enhance public understanding of the project and encourage community participation in watershed restoration and protection activities. LWA is the primary entity for education and outreach campaigns in the watershed and for development of this plan. LWA should continue all aspects of their education and outreach programs and consider developing new ones or improving existing ones to reach more watershed residents. Educational campaigns specific to the five Action Plan categories are detailed in their respective tables (Section 5.2). Annual Advisory Committee meetings should be organized to review the status of goals and objectives presented in this watershed restoration plan. It is recommended that an adaptive management approach be used to assess annual progress, determine key projects for the following year, and provide a venue for sharing information with watershed stakeholders. Adaptive management is the process by which new information about the health of the watershed is incorporated into the plan. This process allows stakeholders the opportunity to evaluate the effectiveness of restoration and monitoring activities before implementing future actions. Tasks listed in the Action Plan should be tracked and recorded as they occur, and new tasks should be added to the plan as determined through the adaptive management process. All achievements, such as press releases, outreach activities, number of sites repaired, number of volunteers, amount of funding received, number of sites documented, should be tracked. Stakeholders can then use the established indicators (Section 5.3) to determine the effectiveness of the plan. Watershed residents, landowners, business owners, and recreationalists alike should have a vested interest in protecting the long-term water quality of MBI for future generations. With a goal of reducing in-lake phosphorus concentrations to acceptable oligotrophic thresholds in the three basins, implementation of the plan to achieve this over the next twenty years is projected to cost over $1,000,000, and will require the dedication and hard work of municipalities, conservation groups, and volunteers to ensure that the actions identified in this plan are carried out accordingly. 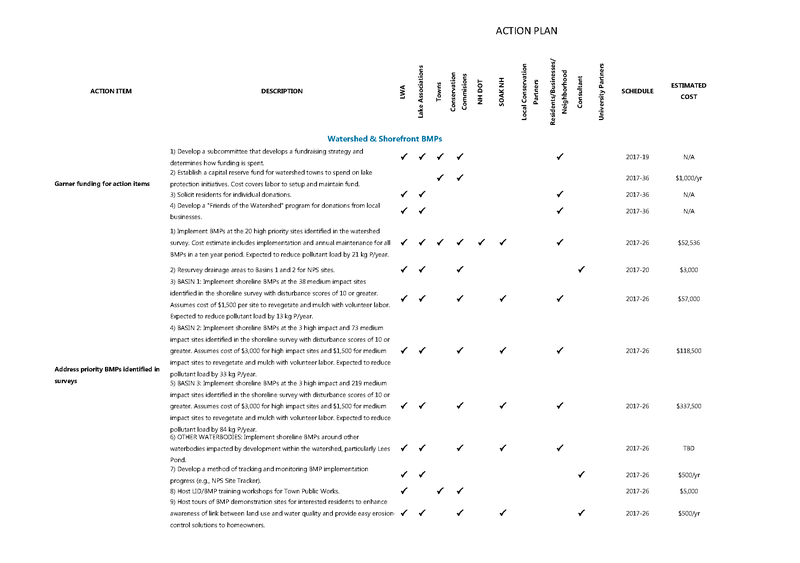 The Action Plan will need to be updated as the plan is implemented and new action items are added, in accordance with the adaptive management approach detailed in Section 4.4. Please refer to the Executive Summary for a summary of the plan.